Hingham, MA – A booming business, microbreweries are also characterized by heavy manual work for an often very limited number of staff members. It takes two to lift and turn a barrel and a forklift truck to stack barrels ready for delivery. The result – high risk of strain injuries and expensive machine investments. A vacuum-operated barrel handling solution can change that. Promising to make breweries of all sizes more productive and more ergonomically friendly workplaces, the Vaculex® VL will lift, rotate and stack heavy and bulky kegs or barrels in one motion. It enables parts of the process to be handled by one member of staff and without the need of a forklift. Suitable for handling half barrels (50-60 liters), an ergonomic Vaculex® VL has been specifically developed for the brewery industry. Powered by an electric vacuum pump the Vaculex® VL will lift any barrel allowing workers to manoeuver and transfer these with ease and without fear of strain or repetitive injuries. Enabling procedures to be carried out in space-restricted areas, Piab offers unique and flexible solutions where ceiling height, narrow and confined areas with limited available working space may be an issue. Low profile crane systems, monorails, and carbon fiber arms are examples of how Piab provides users with innovative answers to challenging environments. Offering an ergonomic and safe working environment, Vaculex® VL enables breweries to operate more efficiently. For instance, as barrels are often filled from the underside, they need to be turned upside down as well as lifted during the process, and then lifted for stacking. 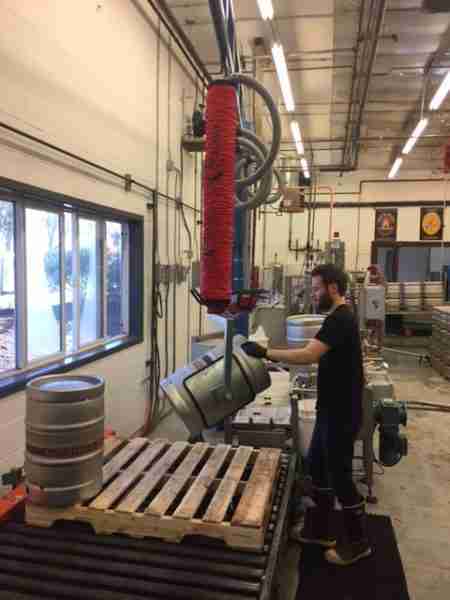 Weighing up to 165 lbs a piece, this is a back-breaking job even for two workers, but an easy task for an ergonomic Vaculex® lifter operated by one brewery employee. A complete range of spare parts and helpful accessories – such as a handy remote control, a noise reducing hood and an energy-saving system for automatic pump turn-off during inactivity – coupled with outstanding after-sales support and maintenance enable customers to rest assured that they will be working with ease before, during and after purchasing a Vaculex® lifting solution.